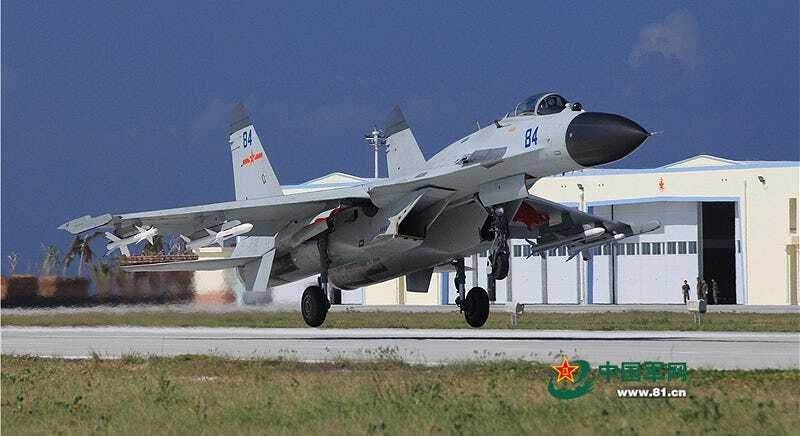 China posted pictures of armed J-11 Flanker fighters operating from Woody Island located in the northern portion of the South China Sea. China has been totally remodeling its runway and aviation support facilities on the Paracel Islands outpost located about 200 miles south of Hainan Island, a project that appears to be complete. Deploying these fighters to Woody Island gives China an air defense and strike capability ranging from Taiwan’s Pratas Island to the north, to the majority of Vietnam to the west, to the Philippines in the east, and down towards China’s South China Sea island building projects in and near the Spratly Island archipelago. With aerial refueling, the J-11’s range increases, and this does not take into account standoff attack weaponry in the strike role. Woody Island also serves as a Chinese port for naval, coast-guard and fishing vessels, as well as a signals intelligence collection point and radar station for the region. In total, it is a nerve center for surveillance of the northern portion of the South China Sea for the Chinese military. As such, the island is highly developed, with a large administration building, quality living facilities, a school and other accouterments for the roughly 1,000 people who live there. You can read about a see just how elaborate the facilities are on the island in this article, with the island’s elaborate radar tower being especially interesting. The fact that China is now operating some of its most capable fighters from Woody Island after the remote locales’ aviation facilities were upgraded, even if temporarily, serves as a likely preview of what is to come farther to the south at the country’s disputed island building projects. A similar runway facility is almost complete on Fiery Cross Island, and once operational, it could allow China to provide a persistent air defense, strike, and maritime patrol capability that could span the southern half of the South China Sea. When paired with Woody Island, China could be able to patrol, and to some degree control, nearly the entire South China Sea. This is all part of China’s increasingly clear anti-access, area-denial strategy for the South China Sea, a body of water that is one of the world’s most important shipping corridors and a rich fishing ground. It is also thought to have vast energy development potential. With all this in mind, it is more likely than not that we will see Chinese fighter aircraft operating throughout the South China Sea in the not so distant future. When China’s air power is combined with advanced land-based surface-to-air and anti-ship missiles, as well as naval assets, China will be able to switch off access to the South China Sea with a declaration alone. At which point the only option beyond diplomacy is to test their word, and that could be a very messy and deadly proposition to say the least.